We must keep our communities together. Kensington needs housing for residents that is genuinely affordable for a range of income levels. I support rent control and security for private tenants. Not only does it make economic sense for people to be able to live close to where they work, but there is plenty of evidence that communities from diverse backgrounds, with mixed incomes who are integrated have much greater social cohesion and stability. To keep Kensington affordable for a variety of people, I support a London Living Wage for all workers. I will work to create cleaner air and safer streets by greening the Westway. We also need safe cycle-ways and we must implement the Cycle Superhighway. As your voice in Westminster, I will campaign to end diesel emissions from trains, taxis, vans and lorries and work to improve air quality. For the safety of Kensington’s residents, especially children, we must implement a 20mph speed limit on borough roads. I will ensure that development enhances the borough and benefits all its residents. This means campaigning to continue reductions in the scope and size of basement excavations, their noise, and their disruption to neighbours. We should protect our built heritage throughout Kensington. We need truly affordable housing in Kensington; all S106 affordable housing must be built on site. We must encourage neighbourhood forums so local voices can be heard in all areas of planning. We need a transparent and locally accountable system for all planning decisions that responds to the concerns of residents. As your MP I vow to make sure the needs of less affluent and vulnerable residents are represented in Westminster. I will campaign for affordable energy bills, lower childcare costs, and to save the Independent Living Fund. When governments need to raise more money we must be willing to ask those with the broadest shoulders to contribute more; this is why I support revaluation and re-banding of property for Council Tax instead of a ‘Mansion Tax’. This is a long-standing policy choice of Kensington Labour. I also support the reversal of the Bedroom tax, which is an unfair tax on many of the poorest in society. We must defend our NHS from the threat of privatisation. Britain has one of the best and most affordable healthcare systems in the world. I pledge to consider ways of making it more efficient while maintaining the quality of care that makes our system great. We must improve local NHS and mental health services, and provide affordable social care. I promise to fight against any attempts at privatisation. I will listen to the suggestions of doctors and nurses, not lawyers and politicians. My academic expertise convinces me that we need to think differently from the coalition government about how to grow our economy and generate well-paid, secure employment. Austerity fails to encourage sustainable economic growth. We need to focus on investing in high quality apprenticeships. We must ensure an equality of esteem and good pay for those who want to take up vocational training and careers. These decisions will help people realise their potential and encourage a diversified economy. We also need to use the power of government to encourage economic growth in times of recession and then make sure government saves money during periods of growth to protect the public in times of economic difficulty. We must also make sure that the backbone of our economy like mass transit is affordable and run in the public interest. This is why I support the nationalisation of the railway system to ensure investment and bring ticket prices down. International trade agreements can generate jobs and encourage economic growth for partner countries. However, how they are negotiated and the protections that are included in them are critical to whether these agreements are beneficial for working families in the U.K. The ongoing TTIP negotiations between the EU and the US need much greater scrutiny and prior agreement that we will not reduce environmental or labour protections as part of the deal. We need fundamental reform of policies used to encourage development and economic growth throughout the world, including our stance on the policies of the World Bank and the International Monetary Fund. It is investment not austerity that guides countries back to growth and productivity. The EU was originally designed to forge economic and social links between European nations. The EU is important for the UK economy; over 50% of our exports are to the EU. Millions of jobs rely upon our membership. Our economy is also much stronger because of the skilled workers that come to the UK. Though we need to ensure that workers in the UK are not undercut and workers from abroad are not exploited by unscrupulous employers, we must remain in the EU to maintain a vibrant economy in the United Kingdom. I disagree with the renewal of Trident. These weapons do not make us any safer, in fact most evidence points to increased likelihood of major nuclear accidents and inadvertent nuclear war. Kensington’s diverse population is especially concerned with international issues. An equitable and just solution for Palestine is a lynchpin of broader peace in the Middle East. A Palestinian state based on the 1967 ceasefire lines would be an important first step. Kensington residents need a locally based, visible, responsive and representative Member of Parliament. As your MP I promise not to take any paid directorships. Being a responsive Member of Parliament is a full time job. 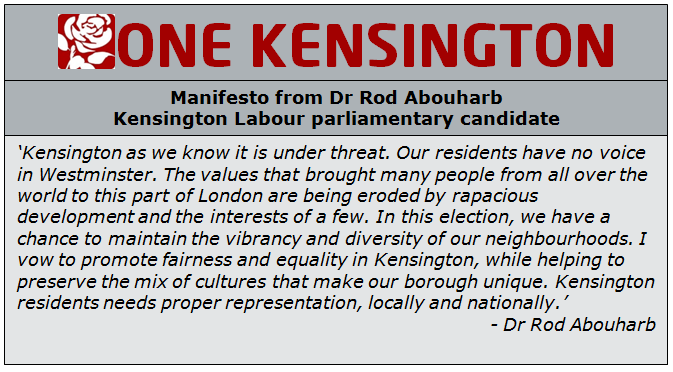 Kensington’s residents deserve an MP who will be fully engaged as their representative. I will publicise and hold regular surgeries in the north, centre and south of Kensington. For those residents who have difficulty travelling; I am your representative and I will come to you. Next Next post: STOP PRESS – Kensington Labour closing the gap!